For Jocelyn McComb, spending the first two months of her life in Royal Columbian Hospital has been a source of inspiration. 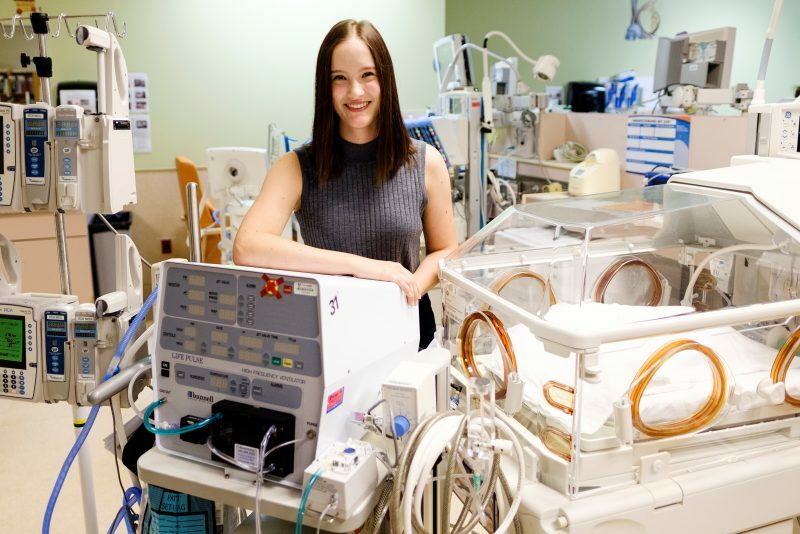 The 20-year old Surrey resident was born 13-weeks premature, and the stories she’s heard about her time in the neonatal intensive care unit (at the time known as the special care nursery) have encouraged her to pursue a career in nursing. Jocelyn McComb, during a visit to Royal Columbian Hospital’s Variety Neonatal Intensive Care Unit. “Just hearing from my parents how caring everybody was has helped me decide what I want to do and helps me become a more caring person too,” says Jocelyn as she heads into the second year of her nursing studies. She was born at 27-weeks, weighing two pounds, two ounces. Her parents Sandra and Andy say they quickly were put at ease despite the unexpected events of two decades ago. After eight weeks, Jocelyn was ready to go home. Each year since, the family has made it a point to return to visit the neonatal team at Royal Columbian. Variety Neonatal Intensive Care Unit manager Queenie Lai enjoys the regular visits and says it is helpful for families who are currently in the unit to see that someone like Jocelyn was once in an incubator too. While she is drawn to neonatal care, Jocelyn says it’s still too early for her to commit to any specific career choice yet. However, she is impressed by the team at Royal Columbian.